A creative, bold and playful arts education organisation. Providing inspiration and creativity between the arts and education. 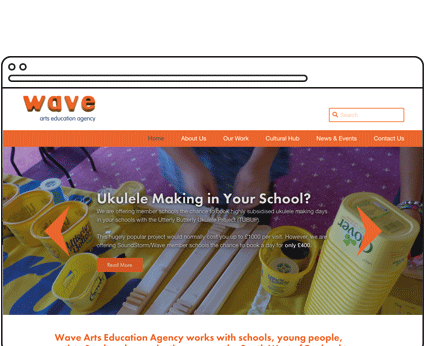 Wave Arts Education Agency bridges the gap between the arts and education communities in Bournemouth & Poole, Dorset. Wave work with educators, local authorities, artists and cultural practitioners to provide young people with regular access to high quality arts experiences. We worked with Wave on a complete rebrand. The brief was "a playful logo and brand that would appeal to both adults and children". We explored the idea of magnetic letters because neither adults or children can resist playing with them. As an arts education organisation, the core of everything that Wave does is fun and creative. The brand needed to reflect that playful, accessible approach. The result of the branding was a colourful, eye-catching and flexible identity and logo that works excellently on print and marketing communications. A core part of Wave's purpose is to get out to schools and arts spaces and bring the two together. We thought we'd make the brand reflect this by producing the logo in giant 1.5 metre letters and photographing them in the places that Wave work. A lot of fun ensued. As part of our work with Wave we also developed the "Cultural Hub" connections graphics to illustrate all of the organisations within the hub network. This was distributed for free to partner organisations and featured in The Journal of Arts Marketing. The Wave brand remains a striking and eye-catching brand, especially when placed alongside other educational organisations' branding within the same sector. The brand has worked across all of their output for over 8 years, including business stationery, reports, marketing materials and digital. The Cultural Hub Connections design that we created for Wave was published in The Journal of Arts Marketing, the national Arts Marketing Association's quarterly publication. "It was great to work with a design company who really took time to listen to our brief, then got stuck in with a creative dialogue that found solutions that made real connections with our clients. The ideas that emerged from Wired Canvas were bold, playful and above all put into practice. They didn’t just Photoshop in a set of meter high magnetic letters, they actually had them made and we had a lot of fun taking them out to all of the places that we worked for our clients to interact with too. The results were spot on. The brand communicates our message, demonstrates the ethos of our work and has succeeded in catching the attention of new clients, enabling our organisation to continue to grow."